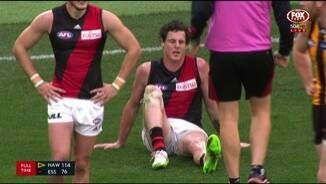 Essendon's intensity at the ball has dropped away since half time. In the first half, the Bombers won 24 more ground balls (6034) however since the main break the Hawks lead this category by 23 (51-28). Jared Roughead has kicked just his first goal for the day, however he has been a key player for Hawthorn. The big Hawk has recorded 24 disposals, five marks, six clearances, seven tackles and 12 score involvements (gamehigh). 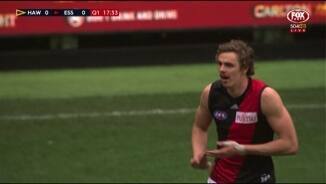 Joe Daniher has had five kicks for four shots at goal, resulting in two behinds and two misses. Of the top 30 goal kickers this season, he has the third worst accuracy (58.8 per cent). Since Jake Melksham's goal at the 21minute mark of the second term to put Essendon six points ahead, Hawthorn has kicked 9.7 (61) to 2.1 (13). 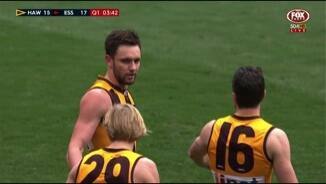 Hawthorn's goal to Breust was set up from a Josh Gibson intercept mark in defensive 50. The Hawks have taken the ball from this zone to inside 50 on nine from 22 attempts (40.9 per cent), well above the season average rate of 20.5 per cent. 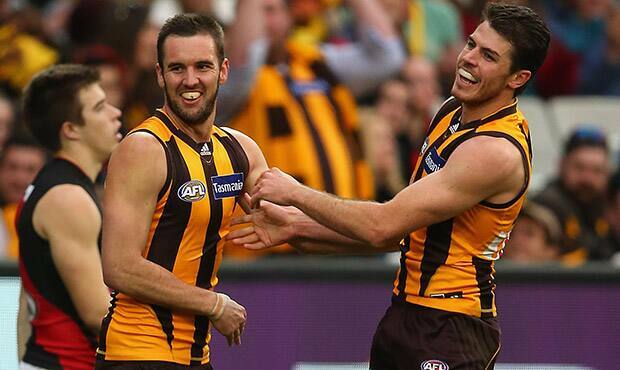 Hawthorn registered 11 more forward 50 entries (187) and seven more marks in that zone (8-1) in the third quarter. Of the Hawks' 42 points for the quarter, 5.2 (32) were created from forward half sources. Hawthorn has dominated the third term, with the ball in its half for 74.8 per cent of the quarter. The Hawks dominated many metrics across both ball possession and use, winning seven more clearances (114) and 31 more disposals (93-62). Paul Puopolo has kicked his third goal for the quarter and fourth for the game. This is only the third time in 98 career games he has kicked three goals in a quarter. His biggest bag of goals is five, against Port Adelaide in Round 20 2012. Carlisle is the most threatening marking forward on the ground. He has taken eight marks, with three contested and three inside forward 50. He has been involved in seven scoring chains for Essendon, including kicking 2.1 of his own. In the past ten minutes Hawthorn has won more of the ball and been far more precise by foot. 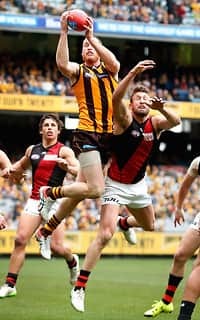 In this period the Hawks have recorded 17 kicks at 82 per cent effectiveness, while the Bombers have won six kicks at just 33 per cent effectiveness. 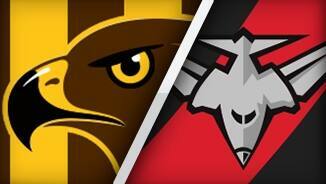 Hawks InterchangeJames Frawley off due to an injury. Welcome to MCG for the Hawthorn v Essendon Round 13 clash. HAWTHORN has brushed aside a brave Essendon with a dominant 11-goal second half to secure a 38-point victory at the MCG on Saturday that takes it back into the top four. The Bombers took the fight up to the Hawks in the first half, playing with good intensity after their round 11 bye and threatened a repeat of their shock round two win over the reigning premiers when they were just one point behind at the main break. But the Hawks put the foot down in the third term kicking six goals to the Bombers' two to set up a 16.18 (114) to 11.10 (76) victory, which was their fourth win in a row and their sixth from their past seven clashes against the Bombers. However, Hawthorn's victory was soured by a shoulder injury to James Frawley that could sideline the key defender for the rest of the season. Frawley was substituted out of the game after appearing todislocate his shoulder in a marking contest early in the second term, an injury that followed his pectoral strain in the Hawks' round two loss to the Bombers. Leading sports medico Dr Peter Larkins told 3AW at half-time that Frawley would require surgery to repair his shoulder at some stage, a procedure that would sideline the key defender for about three months. The Hawks also lost Cyril Rioli before the match due to a family funeral but Paul Puopolo stood up in the star small forward's absence, kicking four goals, including three in Hawthorn's match-winning third quarter. 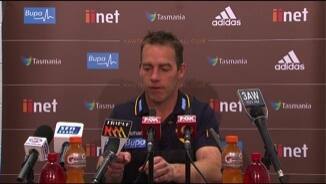 Hawthorn coach Alastair Clarkson said Essendon had dominated possession in the first half but his team had been able to address this in the second half. "We just weren't anywhere near as good as the Essendon side in hunting the ball and giving ourselves first opportunity," Clarkson said. "They out-possessed us by a mile – particularly in the second quarter – so we needed to address some of those things. "We didn't change much at half-time, except to appeal to them to be better in that area of the game and I thought we were in the third quarter. "That gave us the chance to get the ball into our forward line a little bit more often and gave us a chance to kick a score. That third quarter was obviously pivotal to the game." Sam Mitchell shrugged off a third-term corkie to his right leg to dominate through the midfield for Hawthorn, racking up 33 possessions and five clearances, and he was ably supported by Liam Shiels (28 possessions and seven clearances). Puopolo had plenty of support in attack from Jack Gunston, whose three first-half goals kept the Hawks in touch as the Bombers were having the better of general play. It was only some uncharacteristic inaccuracy in front of goal in the second half – he kicked four behinds – that stopped Gunston from kicking a bag. Brian Lake and Josh Gibson held the Hawks' defence together in Frawley's absence, with Lake keeping an inaccurate Joe Daniher to 1.2 while Gibson racked up 22 possessions and five rebound 50s. Jarryd Roughead and Essendon defender Michael Hurley waged an enthralling duel. The Hawks spearhead kicked just one goal, but he drifted into the midfield regularly and racked up 29 possessions that included seven clearances and four inside 50s. Hurley also gave the Dons a lot of drive from defence, finishing with 29 possessions and six rebound 50s. It was hard to fault Essendon's effort and it fought out the last term with four goals when a blowout loss looked on the cards. But the defeat was the Bombers' fourth in a row and means their finals hopes are now hanging by a thread. After a promising start to the season, Essendon has now lost six of its last seven matches, its only win in that period coming against the lowly Brisbane Lions. 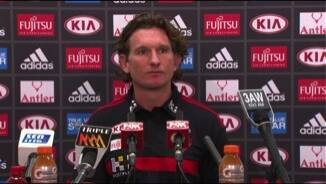 Coach James Hird said his team had played well for three quarters but had let itself down in the third term. "Our effort, our intensity around the ball and our method around the ball was really poor in that third quarter and it cost us," Hird said. "Hawthorn are a quality team and they took advantage of their opportunities when I didn't think we did in the first quarter. I thought we let ourselves down with our [inability] to kick goals and score when we had opportunities. "But from an improved performance point of view I was pleased. I thought we moved the ball better and looked more dangerous in attack than we have for probably four or five weeks." Zach Merrett (31 possessions) and Brendon Goddard (32) were prolific ball winners for Bombers, Shaun McKernan gave them some presence in the ruck after being elevated from the rookie list during the week, and Jake Carlisle kicked three goals. Essendon made a fast start after its round 12 bye, kicking the first two goals of the game as it controlled general play and pressured the Hawks into uncharacteristic skill errors. The Hawks hit back to kick the term's final two goals and trailed by just one point at quarter-time. But Essendon's lead could easily have been greater, with spearheads Daniher and Carlisle together missing three relatively simple set shots. The Bombers maintained their defensive intensity in the second term, kicking two of the first three goals to maintain the lead up until a Gunston goal levelled the scores at the 19-minute mark. The Dons replied quickly from the next centre bounce when Jake Melksham converted on the run from 50m, but Gunston goaled to level the scores again three minutes later. The Hawks took the lead for the first time six minutes later when Roughead kicked a behind from 45m, a one-point buffer they maintained until half-time.